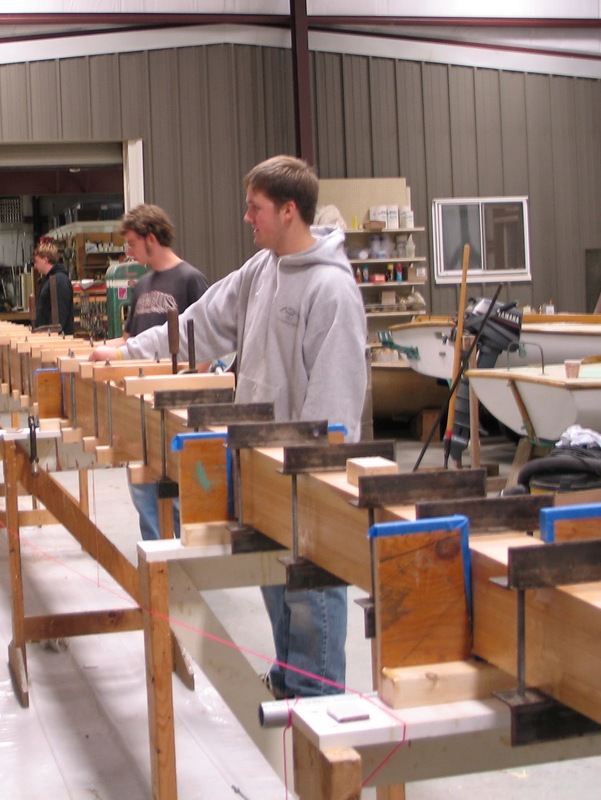 focus: build the best spars and rig the boat properly. The outcome should be well executed, functional, safe, smart, and sail well! Looking back at the history of sailing rigs, one gains an appreciation of the form/function principle: the smaller the vessel the simpler the rig. The obvious function of the spars was to hold the sail in place. Another very important function was to balance the boat. Many of our working boats developed their rigs by trial and error and we have benefited from this rich history so that today, most of the innovation with spars and rigging has more to do with materials than design. In fact some of the world class racing sleds are resorting to a semi gaff headed sail! That may be a broad generalization but the concept is pretty accurate. Spars are the basis for rigging. Rigging is not only functional but beautiful if thought out carefully and executed with an eye to detail. The rigger’s job can be very complex, and if the craftsmanship of the splices or bending on of the sails or serving of the standing rigging is not done well, then the entire ship is at risk. This holds true for any vessel large or small. Lines unravel if they’re not whipped. Knots come loose if they’re not properly tied. And if you choose the wrong knot for the job then that could haunt you later. Mastheads are the pinnacle of rigging: everything meets at the top. The mast on the left is 56 feet, so everything had better work. A fractional rig is so dependant on standing rigging and all the accompanying hardware, most of which must be fabricated to fit properly. 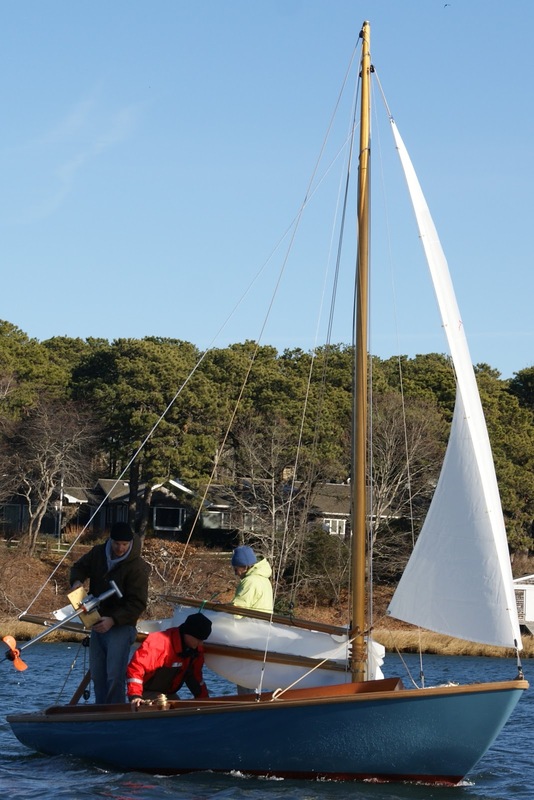 The box section itself is not strong enough to carry the load of a full mainsail and jib. Internal blocking must be carefully conceived, and properly shaped. Once the box is assembled and glued, there is no chance of making adjustments. All the standing and running rigging issues need to be addressed beforehand. Any elecrical plans should be drawn out on paper then installed before assembly. The fractional rig offers so may challenges but the catboat rig is by far our favorite, offering its own set of critera and problems to solve. Perhaps its the appearance of simplicity that draws boat owners to this very American rig. To the spar maker, the challenge is in making it perform well but safely. With new fibers on the market we can now rig these boats using some time worn traditions, such as strops in place of through bolts. What a sight to see beautifully rigged boats tracking on course, sails trimmed right, spars shapely and strong, but not too heavy. Proportions are just right. All the rigging works as it should. The sail goes up and down with ease and sheets nicely too. 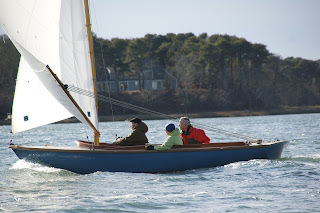 Speed and the ablilty to point well were never atributable to catboats but that has all changed today. Boats can be built to high performance standards without looking too modern. Just look at these two! 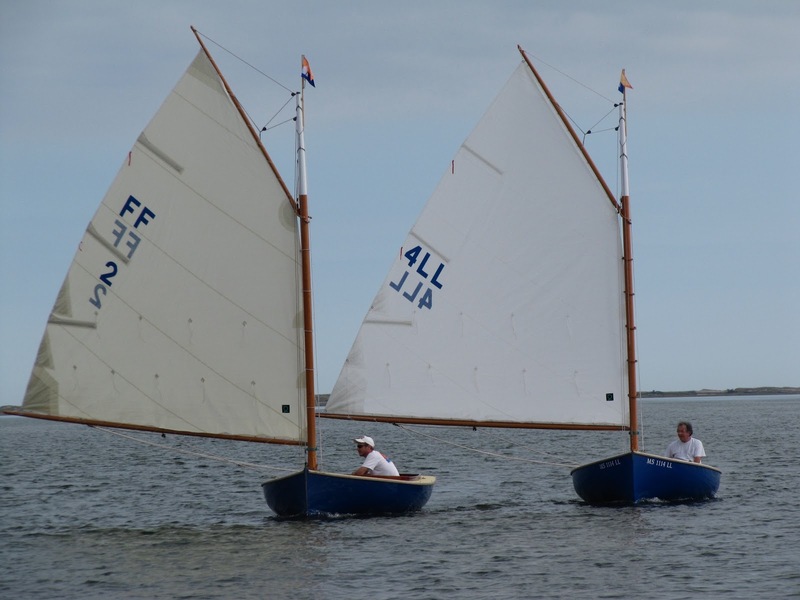 People assume that a 14 foot catboat is small compared to its 18 foot cousin. 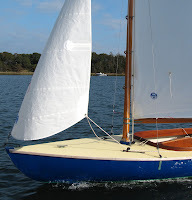 Catboats increase exponentially in all dimensions when you lengthen the waterline. Suddenly an 18 footer becomes a really big boat. The 14 foot Classic Cat is an incredibly roomy boat that can actually accommodate two adults for an overnight or four comfortably for a day sail. What strikes me is the versatility of the boat at this length. The shallow draft allows for some serious gunk holing. The rig is easily stepped by one person. Our hollow birds mouth mast typically weighs 45 lbs or so. The displacement is 650lbs compared to the 2,200lbs of the 18 footer. Pushing it off a sandbar is never a problem. Getting the Classic Cat ready to go takes minutes, and is easily single handed. Going out for a quick sail after work is never an issue. For many of us that's what it's all about, with our busy schedule: getting out there and enjoying a wonderful sail without all the hassle. When we get calls about our boats we try to listen to the type of sailing being described. More and more, the appeal of the small catboat stands up against the romance of a bigger boat. What kind of sailor are you? Solo? Racer? Family boat? These little catboats handle the variety of sailors with ease. In our world on Pleasant Bay, cruising has taken on a whole new meaning. It can be a moonlight sail, or a picnic with friends or just the dog. It can be a challenge with a double reef or a near walk about from lack of wind. But whatever the circumstances these little boats offer so much more for so little cost and effort. Our first Hurricane, Meander was launched the week before Christmas on a cold gusty day. On board were owner Jim Moir, builder Seth Ahrenholz and Suzanne Leahy, owner of Pleasant Bay Boat and Spar Company. After three days of test sailing, we were finally able to celebrate. Not only did Meander look incredibly good, she handled superbly. The Hurricane is a keel/centerboard version of a retake on Carl Alberg's Typhoon. The most striking difference above the waterline is the traditional gaff rig. This boat rides lower in the water thanks to the removal of four inches of freeboard. The combination of reduced freeboard and a small centerboard makes this a very trailerable boat. The biggest plus is the handling at the helm and on the sheets. I love a big boat thrill and this boat has all of it without the hassle. The roomy cockpit was comfortable and dry (!) in spite of the breeze and the wintry water temperature. Merv Hammatt conceived this boat, knowing the popularity of the Typhoon, and the benefits of a more manageable package. In a few short years he had built twelve Hurricanes. Pleasant Bay Boat and Spar was busy for the first few years after taking over from Merv building the Baybird and making a new plug for the Classic Cat. 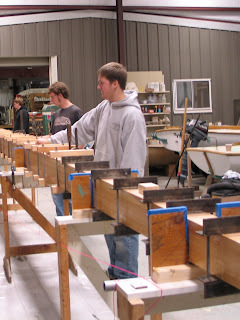 Last February the Moirs commissioned us to build our first Hurricane. 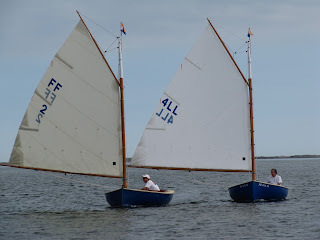 Jim was the dream customer, with a font of knowledge and knowing exactly what he wanted, working with Brian Porter, Seth set out to build a custom sloop, rigged by Doug Ingram using innovative materials on our signature hollow spars. Jim wanted and electric outboard and chose a Torqueedo with battery storage inside a bridge deck. The O/B weighs 15 lbs making removal a snap. You can see from all the activity on deck that removing an outboard would have been awkward, but with a light electric motor storing it was so easy. It moved along at 4 knots with hardly any effort or noise. We can't wait to sail it in warmer weather. Meander's homeport is Stuart, Florida, so hopefully we'll get that chance.